Strawberry Capital, the personal investment company of Nordic hotel Billionaire Petter Stordalen is preparing to invest in Sea Lice startup, Blue Lice. Among 2074 startups across the Nordics, Blue Lice won the coveted Strawberry Million in Stockholm today. “An unreal experience for life”, states company CEO, Karoline Sjødal Olsen. Nordic startups and investments are on the rise. Over the past few years, a growing number of entrepreneurs, startups and investors have all helped spark a small revolution across the Nordic Startup scene. One of these is hotel billionaire, Petter Stordalen and his Strawberry Million. 2074 startups from across the Nordics all applied, pitched and competed for the final pitch round in Stockholm, Sweden. Today, in an intense competition, Blue Lice came out as one of two winners among the nearly 2100 applicants. Norwegian startup Blue Lice was founded during X2 Labs Accelerator Program «Blue Revolution – Tomorrow’s Aquaculture» in March 2017. The program was designed to explore key industry challenges in the global aquaculture industry - and build fast-moving startups to attack those problems. The young team of founders met during the program and rapidly starting working on one of the industry’s biggest challenges – sea lice. Rapidly gaining interest from key industry stakeholders, the team was able to get critical insights and rapidly test out early concept ideas. “We saw a young and very promising team emerge, a team that worked superbly well together”, says X2 Labs co-founder, Christian Rangen. The past few months have seen international investor pitches in London, a banking partner in Sparebank 1 SR-Bank and first external investors secured. “We have huge expectations of and a great belief in Blue Lice and all key partners”, says Rangen. «This is the craziest experience ever! The Blue Lice team is grateful Petter believes in our concept” , says CEO Karoline Sjødal Olsen. Olsen joined the X2 Labs program while still finishing her Master’s Degree at NTNU. Today, she she’s co-founder and CEO of the startup. 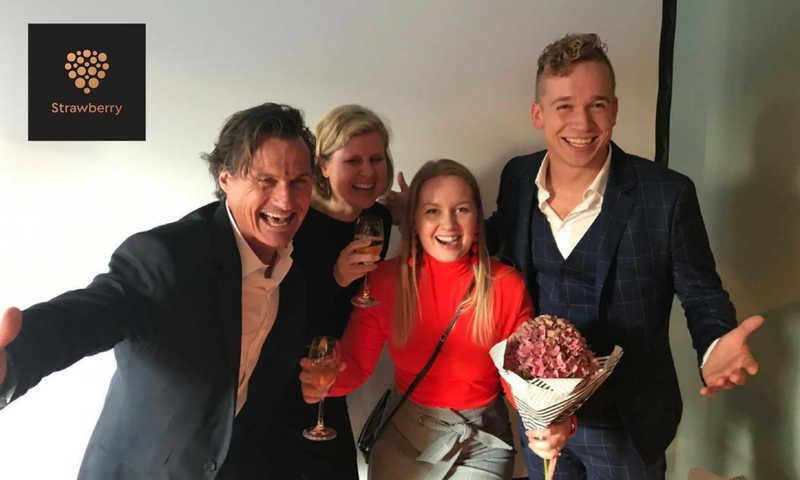 Along with Gry Løkke, Lars-Kristian Opstad and Kjetil Rugland, all coming out of the oil & gas industry, she has spent the last seven months building the team and scaling the company in one of Norway’s fastest growing industries, aquaculture. The investment offer from Strawberry Capital is a big affirmation of the job done so far. Blue Lice is aiming to help solve one of the aquaculture industry’s biggest problems, sea lice. This is a financial problem in the range of 15 BNOK annually, while also being a strategic challenge for an industry facing large growth expecations. The Government has defined fishfarming as one of our national growth industries, aiming for a 5 X growth towards 2050. “In order to achieve this growth ambition, the industry needs to solve the lice problem – and Blue Lice is perfectly positioned”, says X2 Labs Program Director Linn S. Jensen. Blue Lice is one of several new startups coming out of the Accelerator Program X2 Labs, based in Stavanger, Norway. Fishency Innovation, Alphafish, Ready Steady Crew, Myhatt and Una Gruppen are some of the startups coming out of the X2 Labs Accelerator. Now, in its fourth program, “Ocean Space”, participants from eleven nationalities are working to build and scale early startups around tomorrow’s growth industries. This week, Sintef’s Head of Research showed the potential of autonomous shipping in the global $334 BN shipping industry, Statoil showed the global market potential in offshore wind, while tech startup Ocean Hub showed how to build a social media company in the global ocean space industry. In less than four weeks, a new batch of startups will graduate and chase hi-growth opportunities. “Blue Lice is an amazing role model for startups, both in Norway and around the world. The team shows it is fully possible to build new growth startups in just weeks. Being named one of the Nordic’s most promising startups is simply a great validation to an amazing team”, says Rangen.